Sniffer dogs are being trained to see whether they can detect Parkinson’s disease by smell, using the same techniques used to odour-identify illegal drugs, bombs and cancer. 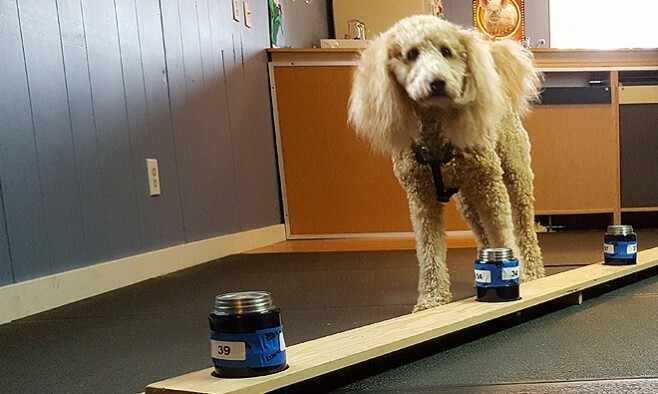 Based in San Juan Island, US, the project’s founders are Lisa Holt, a dog trainer certified by the US-based National Association of Canine Scent Work, and Nancy Jones, whose husband has Parkinson’s. In 2015 Nancy heard about Joy Milne, the lady who, in a pilot study at University of Edinburgh, could detect Parkinson’s just by her sense of smell. 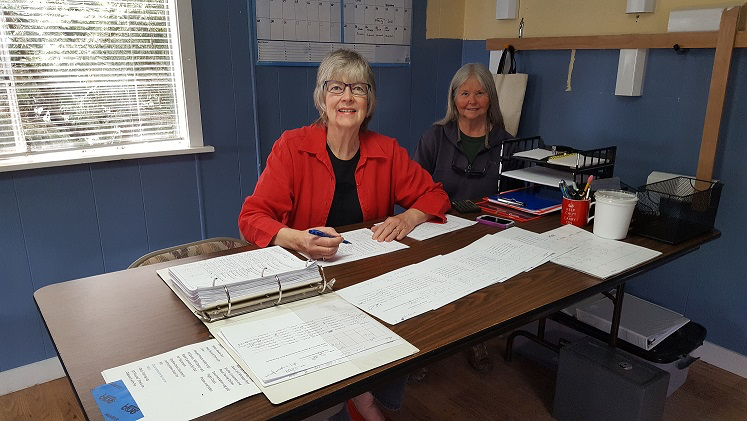 Together Lisa and Nancy decided to round up some dogs – and their handlers – who had some detection experience, contact donors and find a facility to begin a small pilot study of their own. “What started as a grass roots effort has bloomed into a large community effort, and the dogs are now showing signs of positive indication,” Lisa continued. They have now completed a pilot study with six dogs, teaching them to associate the particular smell of a shirt from a person living with Parkinson’s with a ‘primary reinforcer’ – a tasty bite of turkey. 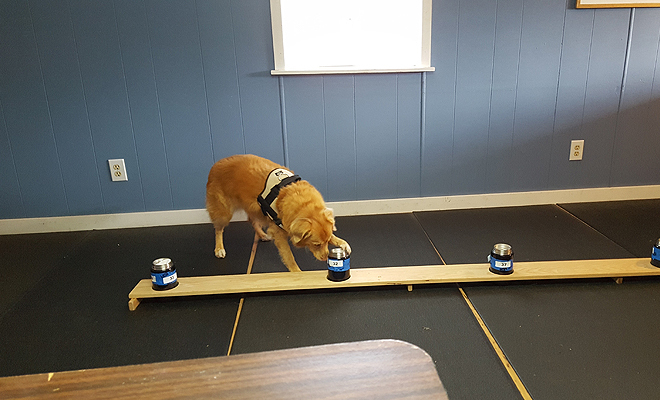 Of the six dogs that took part in the study, five performed at an 80% or higher level of correct response to a T-shirt with a scent sample from someone with Parkinson’s and three of the dogs gave a 90% or higher level of correct response. 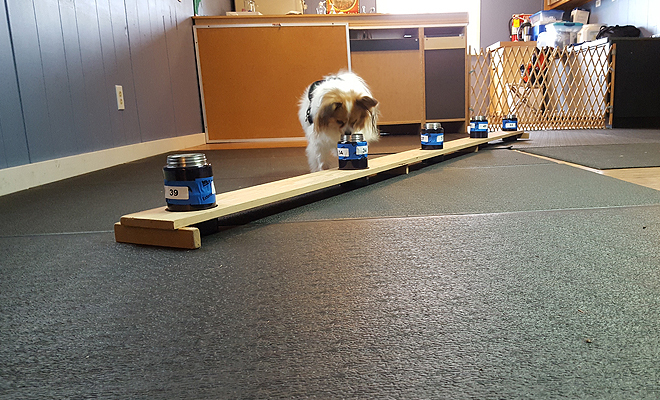 Lisa said that canine detection of Parkinson’s could be life-changing for Parkinson’s patients in two ways. Firstly, the dogs can help with early detection, quite possibly earlier than the first signs of symptoms, which can lead to patients receiving earlier vital treatment. Canine detection could also lead to a more definitive understanding of a biomarker that indicates the presence, or early onset, of Parkinson’s disease. The team hope that, once trained, the dogs can provide valuable research information with regards to how, where and when a biomarker can present itself. “A better understanding of a disease marker can lead research to better ways to manage, fight and even defeat the disease,” Lisa added. This pilot study was a combined effort of many volunteers including; T-shirt sample donors ­– from both people with Parkinson’s disease and people without – scribes for documentation, and the dog handlers themselves who brought their dogs to the facility four days a week over more than 50 days. Lisa and her team are now in the process of setting up a non-profit corporation for the project, but funding is needed for them to continue their work by increasing the number of sniffer dogs, acquiring more donor samples, facility rental and providing sample materials. They are also now seeking funding from the Michael J Fox Foundation. They have passed the initial administrative screening process and are now awaiting a decision on the second step of the application process.